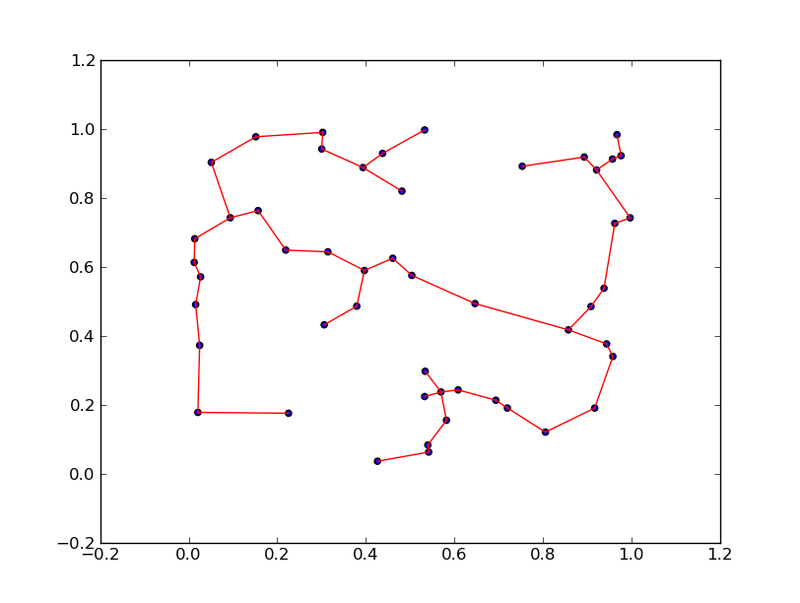 I started working with spanning trees for euclidean distance graphs today. The first think I obviously needed to do was compute the spanning tree. 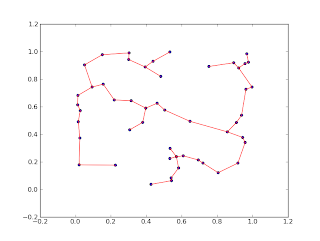 There are MST algorithms in Python, for example in pygraph and networkx. These use their native graph formats, though, which would have meant I'd have to construct a graph from my point set. I didn't see a way on how to do this and set the edge weights without iterating over all edges. That would probably take longer than the computation of the MST, so I decided to do my own small implementation using numpy. This is an instantiation of Prim's algorithm based on numpy matrices. The input is a dense matrix of distances, the output a list of edges. It is not as pretty as I would have hoped but still reasonably short. If any one has suggestions how to make this prettier, I'd love that. """X are edge weights of fully connected graph"""
The algorithms basically works on a dense distance matrix and finds the best possible edge that is reachable from a set of active nodes. All edges that connect nodes already inside the tree are set to infinity so as not to create cycles. I haven't really benchmarked this and it probably loses against any cython implementation but I would hope it is reasonably fast and straight-forward. Thanks for the update! Looks great, I am using your code in my class! Cool. :-) what class is that? I would not recommend it. This algorithm is super serial. Also, I would rather go for Cython. The algorithm is super fast in principal, that is O(|E| log |V|) if you are careful. How big is your graph? Can you Help me how can I code the Relative Neighborhood Graph using PYTHON. My input data is a distance matrix between nodes.